Unless you have been living under a rock, you probably know that Greece is in a debt crisis, as this has been the hot topic of the media for months. But really, all this talk about billions of euros in debt, a ‘Grexit’ from the eurozone, and some kind of Greek referendum, what do they really mean? What is actually going on? So for those who have been hibernating or just waking up from cryosleep as you travelled through space and time, then this guide is for you: An idiot's guide to the Greek debt crisis. Just like an ordinary person, Greece is in so much debt because it spent more money than it earns. Experts think everything went on a nosedive after the country adopted the euro in 2001, therefore abandoning control over its own currency (or monetary sovereignty). Imagine Greece as an average-earning bloke who owns a small retail business and is living beyond his means. One day, he finally gets an invite to join an exclusive club, the European Union (EU), where other members are, let’s say, richer than he is. To be an exclusive member, he has to meet some requirements and do some kind of initiation, and he did. Or so they thought. A few years later, Greece is saying he miscalculated his wealth (with some rumours circulating that he got help from some old members of the other club, Wall Street, to overestimate his earnings to join the EU) and his net worth was actually less and his debts were actually more than what he declared before the EU allowed him to join in. And that’s when things turned nasty, with the problem being exacerbated by the global financial crisis in 2008. Of course, there are other factors at play here (historical, economical and political), but that merits its own article and that we will leave to the academics. So how big is this debt everyone is going crazy about? Put simply, Greece’s debt amounts to 15 Apollo missions to the moon. That’s about €320 billion: €57 billion from Germany; €43 billion from France; €38 billion from Italy; €25 billion from Spain; €63 billion from private institutions; and €62 billion from other lenders. And the country’s GDP (or earnings) in 2014 was only around €283 billion, which means that to be able to pay his debts, Greece has to stop spending entirely in about 14 months. But of course, that’s not possible. The billion euro question: How on earth did this happen? Let’s go back to imagining Greece as a guy living beyond his means. His annual earnings are £30,000, but his actual expenses reach as much as £40,000 per year, including basic necessities such as food and clothing, tax payments, pension contributions, salaries of his employees, business operations, and a few luxuries here and there such as travel and some magazine subscriptions. But Greece started having a hard time with his business. He’s pretty generous to his employees, but not very efficient with collecting money (taxes) from his customers (Greek people), while some of his trusted workers (government officials) have started pocketing the already insufficient money he is earning. So to keep himself and his business afloat, Greece started borrowing money from local and international banks (mostly German), which we will call his ‘creditors’. And as with any kind of debt, he has to pay them eventually. The thing is, with his earnings there’s just no way he could make repayments, and Greece started getting a bad credit reputation. It began when Fitch (some kind of credit police), gave Greece a bad credit rating of ‘BBB+’ from ‘A-‘ in 2009, the first time a country got a rating below ‘A’ status in a decade. Naturally, if you get a bad credit rating, borrowing money can be a real pain. In 2010, Greece turned to his new family, the EU and the European Central Bank (ECB), for help. He went a bit further and asked other relatives as well - the International Monetary Fund (IMF). This trio, called the ‘troika’ (a fancy term for the EU, ECB and the IMF), gave him a bailout loan in 2010 amounting to €110 billion to save him from destitution (not quite), but that still didn’t resolve the issue. Actually, far from it. So he asked for another bailout two years later, and the troika loaned him another €130 billion to help him recover. But the family wasn’t having this anymore, so they put their foot down and told Greece to get his act together by implementing some ‘austerity measures’, which basically means ‘work harder and spend less’. 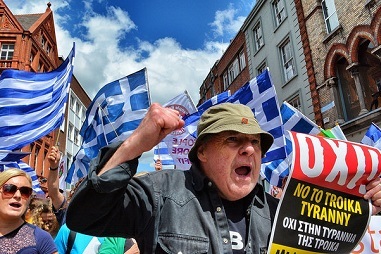 ‘Austerity’ is kind of a hate word in Greece right now and rightly so. To tighten its belt, Greece had to make an aggressive lifestyle change. If this were an ordinary person, Greece would probably cut down his expenses by avoiding pubs and parties and cancelling holidays. He would probably get a night-time job to earn more, or reduce the number of employees in his small retail business. With Greece as a country, it had to make drastic budget cuts, such as reducing the salaries of public sector employees, making cuts to people’s pensions, and increasing tax rates to increase government revenue. The IMF thought these austerity measures would work, and they did, until a certain point. Greece was able to stay afloat and make debt repayments, but he paid a high price for it. Uncle IMF admitted to having underestimated the effects of these austerity measures to Greece, his business and his employees. But hey, uncle IMF thought, it was still a good call because it prevented the spread of this problem to the entire family. A person in debt would only affect himself and perhaps some family and friends. But if a country is in such colossal debt, the economy would suffer greatly. Greece’s economy shrunk by 25% and a quarter of Greeks are unemployed, with half the population living under the poverty line. Click below for Part 2.